Have you lost your key to your Honda? Or broken the fob on the remote? Did your key get lost or stolen and you need a new or spare key for your car? At LA Robin's Lock & Key Locksmith we have local Honda Key Replacement locksmiths to meet the needs for Honda reprogramming and ignition replacement key services 24 hours a day. We offer a broad selection for Honda program and cut, remote fob, trunk, keyless entry, ignition and door lock repair, reprogram, and ecu flash. Instead of paying the expense to have your car towed to the Honda dealership for a Honda Key Replacement, call us to take care of you. With technicians available 24 hours a day to service your Honda key needs quickly. ECU Flashing now available at LA Robin's Lock & Key Locksmith! There are some Honda models that can’t be programmed by a standard key programmer. Unlike standard transponder systems that can programmed on-board or through the OBD II port on a vehicle, some models must go through ECU flashing known as “reflashing”. You have two options if you have lost all the keys to your Honda. You can have your Honda towed to the dealership to have the ECU replaced as some dealers now offer Honda ECU flashing. Dealerships will charge you much more as they have very inflated prices not to mention that extra cost for towing expense. LA Robin's Lock & Key Locksmith will come to your location and do exactly the same thing for half the price of what the dealership would charge for Honda ECU flashing. The ECU is typically located behind the glove box, instrument cluster or under the hood. Once located, the ECU chip is then removed and taken apart to be inspected for a specific chip that will then need to be cleaned, then prepped for a special computer "EZ Flasher" to be attached. The conputer will put the original factory data onto the EEPROM (electrically erasable programmable read-only memory). This allows us to put your Honda into learning mode so new keys can be programmed and the immobilizer will also recognize them. We then re-install the ECU and the new keys are cycled into your Honda. ECU flashing is a specialized service that many automotive locksmiths don’t offer, nor do they carry the equipment or have the knowledge to flash Honda ECU's. Usually it takes around an hour and depending on the model of your Honda as well as the cost of the keys. Typically it can run between $250 and $500. 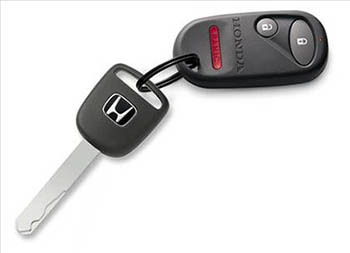 Contact us today, to learn more about our Honda Key Replacement Services.